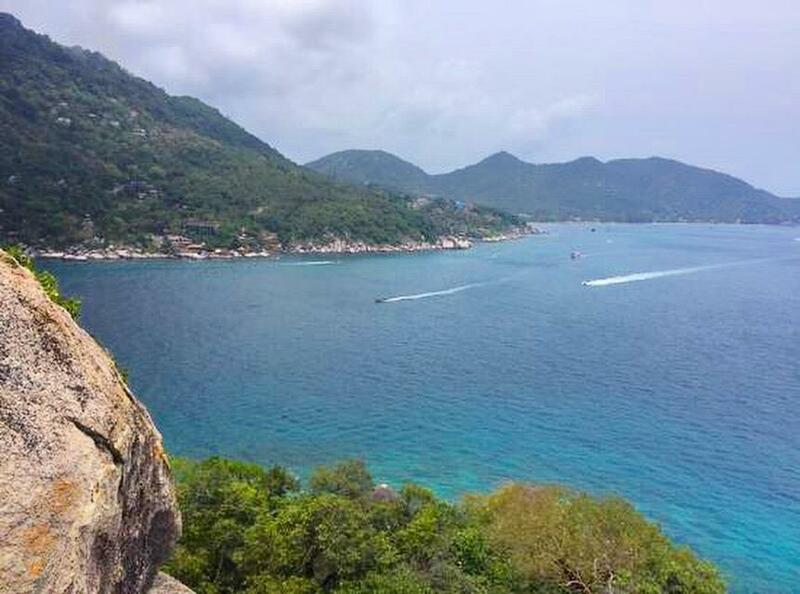 Backpacking Thailand so far has been incredible the Thai islands are the dream destination.. 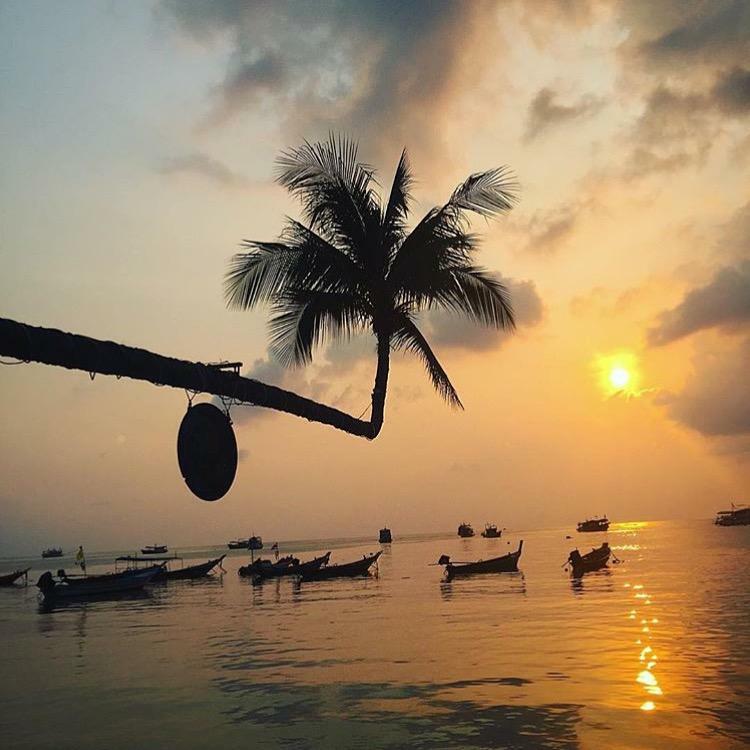 So far on our Backpacking Asia trip we had… spent three weeks spent sunning ourselves in the south (Phi Phi 1/2, Phi Phi 2/2, Koh Phangan, Phuket). Find out what more there is to come here with our (rough) Itinerary. 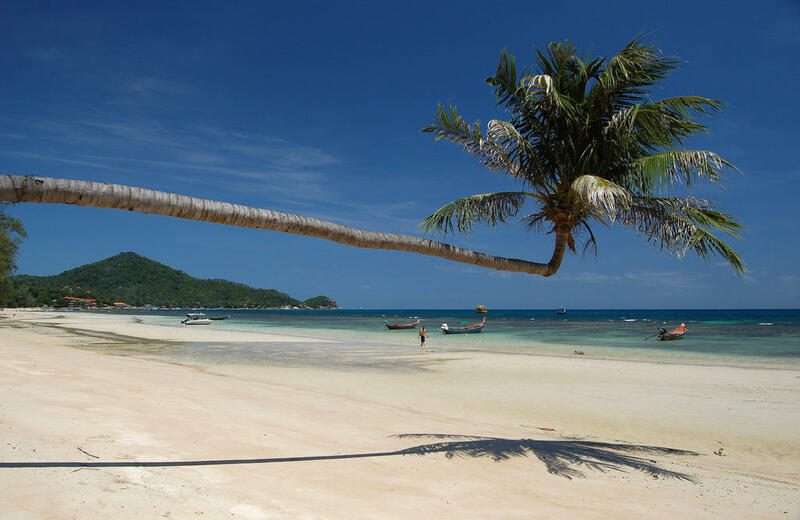 It was time to leave Koh Phangan after our adventures there but our day did not start well… getting up at 6.30am to leave for Koh Tao. On arriving at the port to be told we were booked on the next day… We were not at all… so we went to the ticket office and argued our case, eventually getting our passes!!! 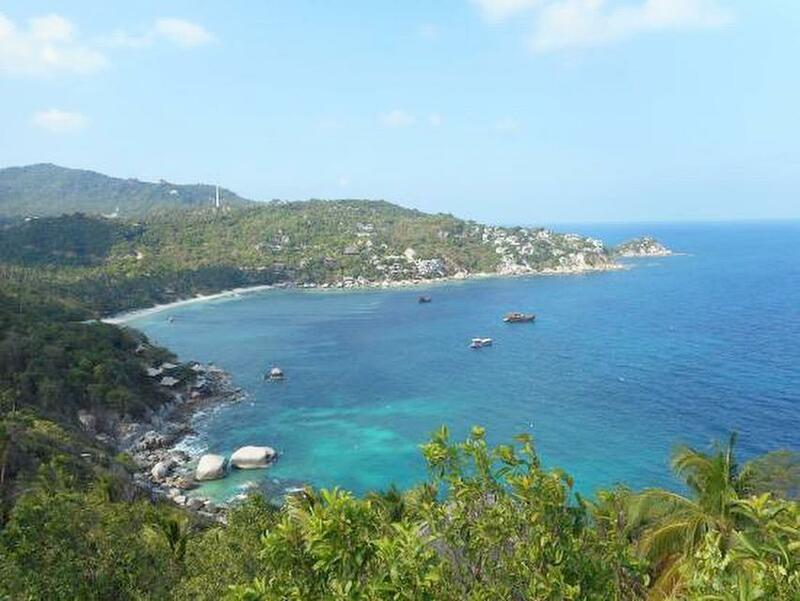 Opting for the faster option of a speed boat over to Koh Tao…. The journey is meant to take 90 minutes.. We were floating out to sea for some unknown reason and we didn’t arrive until 11am. 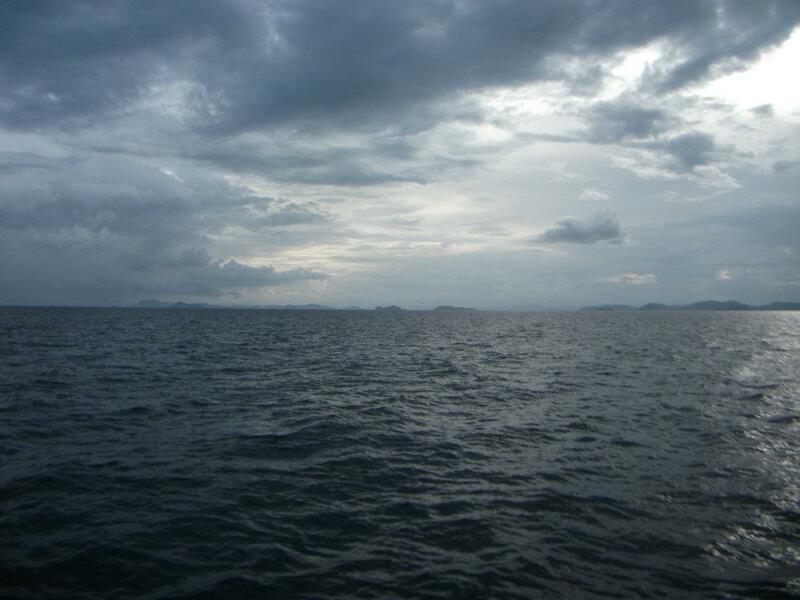 This was one of the first islands we had not looked at accommodation ahead… And we struggled to find anywhere. 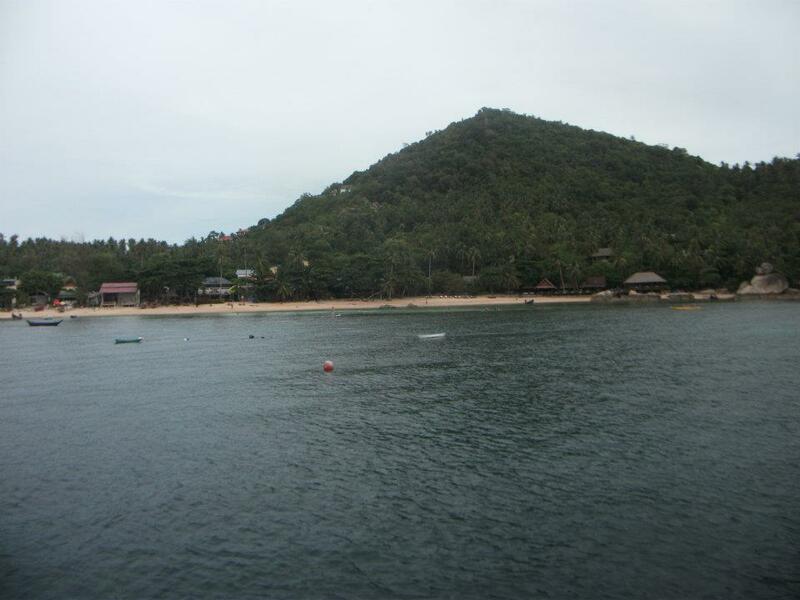 The island being so close to Koh Phangan where the full moon party everywhere was fully booked. We eventually found the Pranee Guest House for less than £12 a night for the room! A clear bargain… With there only now being four of us we had two rooms which were adjoining!! Bonus! 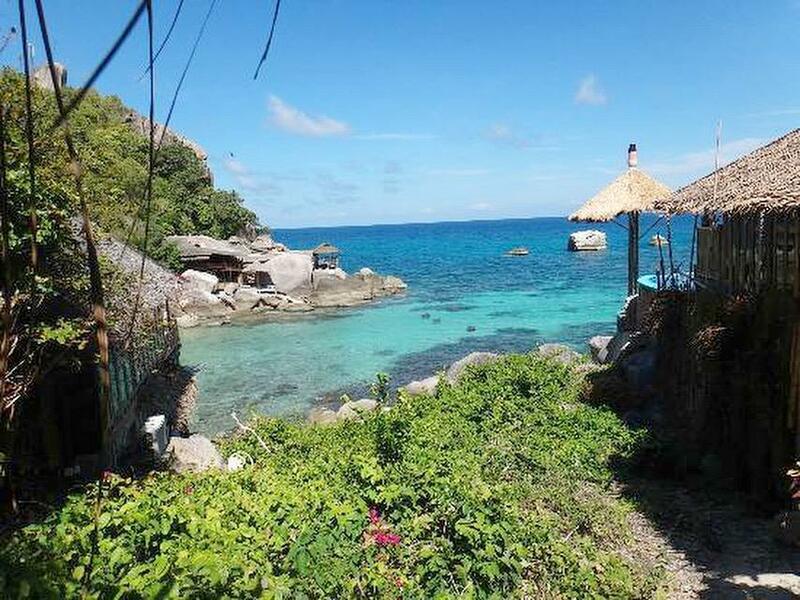 Pranee is in a great location near Sairee Beach (most popular beach on the island) with it being only 1.5 miles to the pier, 1.5miles to mango bay and 1.9 miles to Nang Yuan Island. It is also close to shops, bars and restaurants when in need. 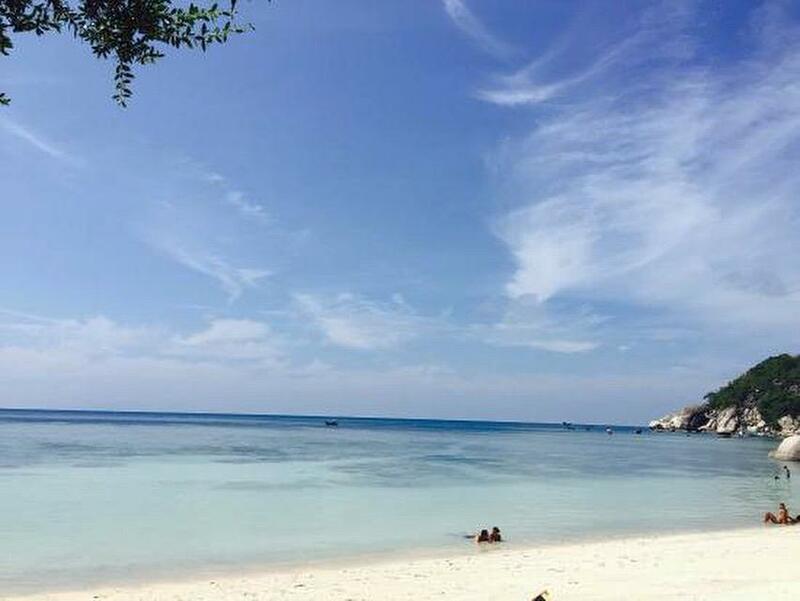 We Walked to Sairee beach and booked scuba diving!!! I had been super excited about doing this. 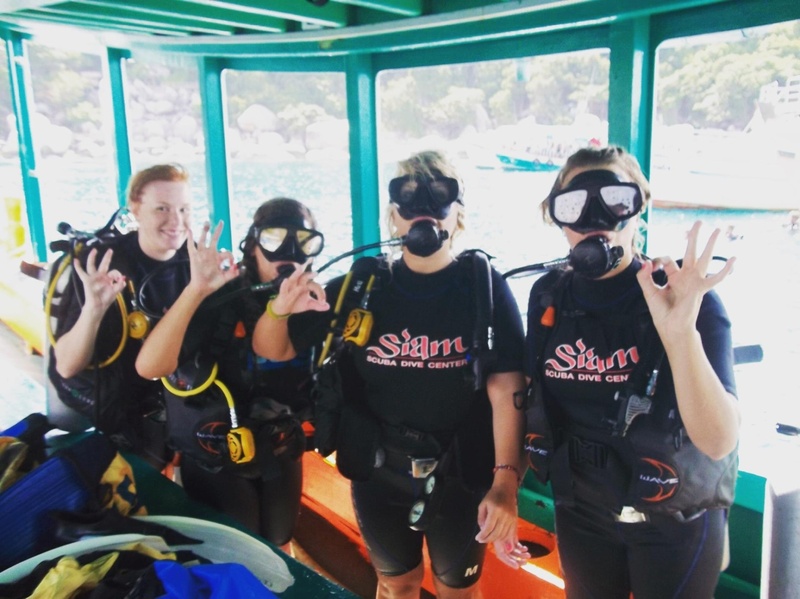 We had priced up a few places but ended up booking at Siam Scuba for 1,800Baht (just under £40 – it felt a lot pricked at the time). The course but was over £300 and was not unfortunately in our backpacking price range – but I would highly recommend this if it’s in yours. After this we went snorkeling in preparation for our scuba diving tour, but it was very choppy and we couldn’t see a lot. So just lay on the beach and sunned ourselves. 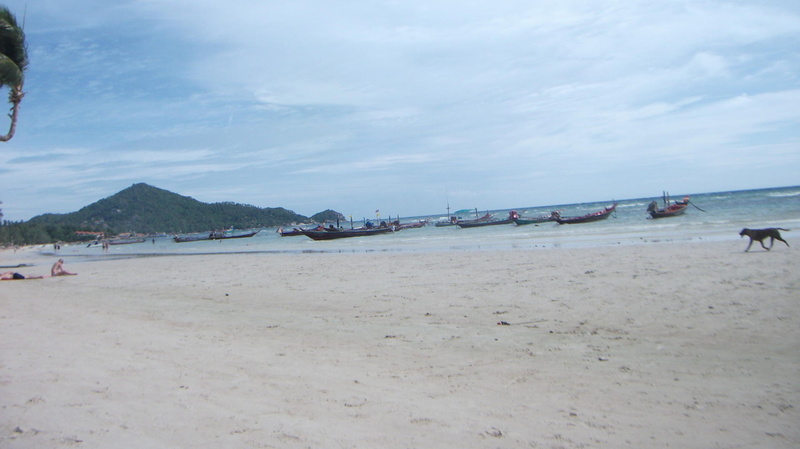 This beach is quite small and relaxed quiet atmosphere that makes it the perfect escape. 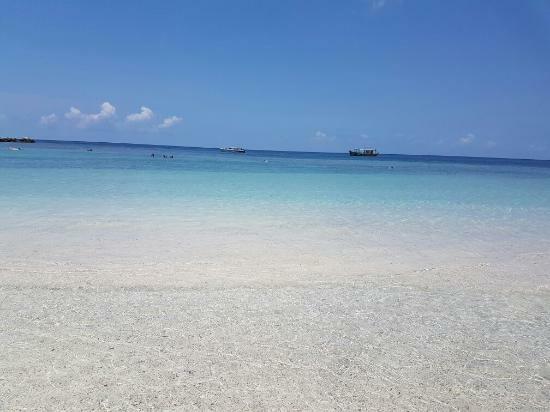 The pictures speak for themselves I would recommended coming here… swim in crystal clear waters and snorkel looking at the beautiful coral. 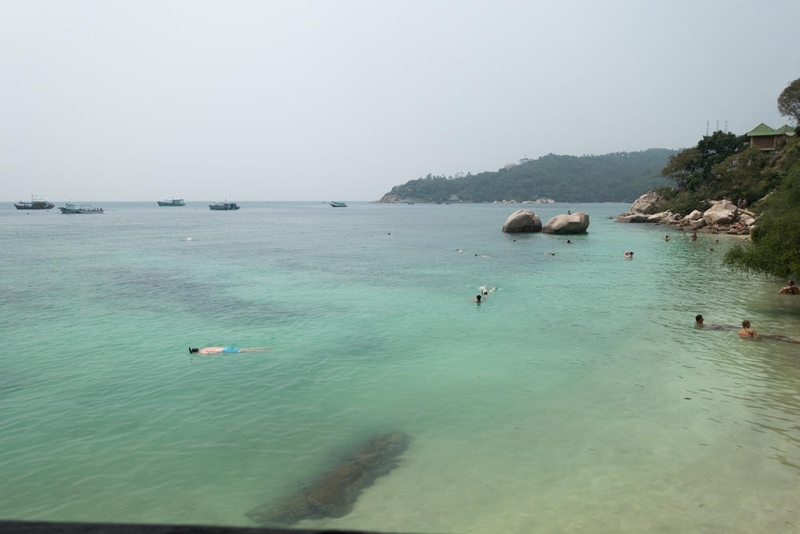 We managed to squeeze in another beach as it was right next door Shark Bay you will have to cut across the Laem Thian resort to explore the beach but it is free and is definitely worth it. The water is turquoise in color and if you visit it between 3pm and 5pm you will be able to swim with blacktop reef sharks, as they populate that area. 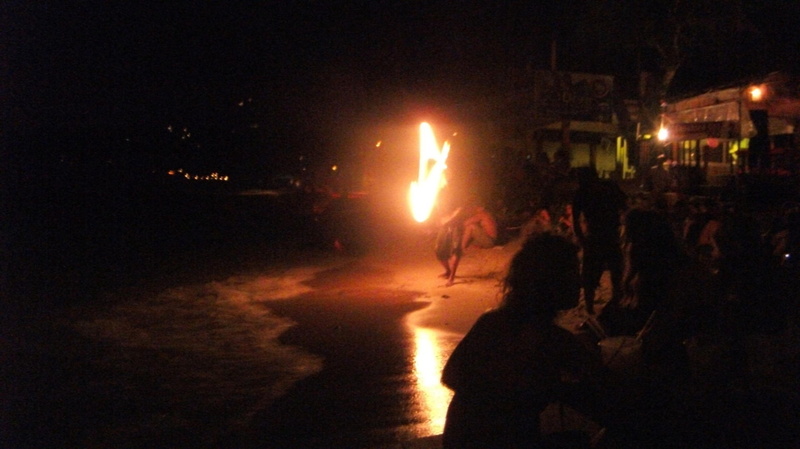 We had heard that this island was a great place to visit for a chill out after full moon. And whoever said that was totally right!! We relaxed here for the rest of the day and literally watched a storm roll in! Absolutely loved it. 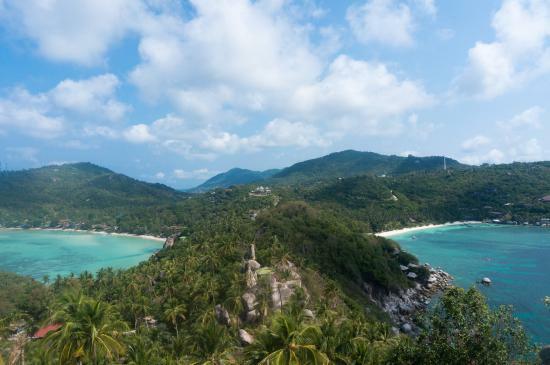 top tip -Koh Tao offers some very cheap Thai food! 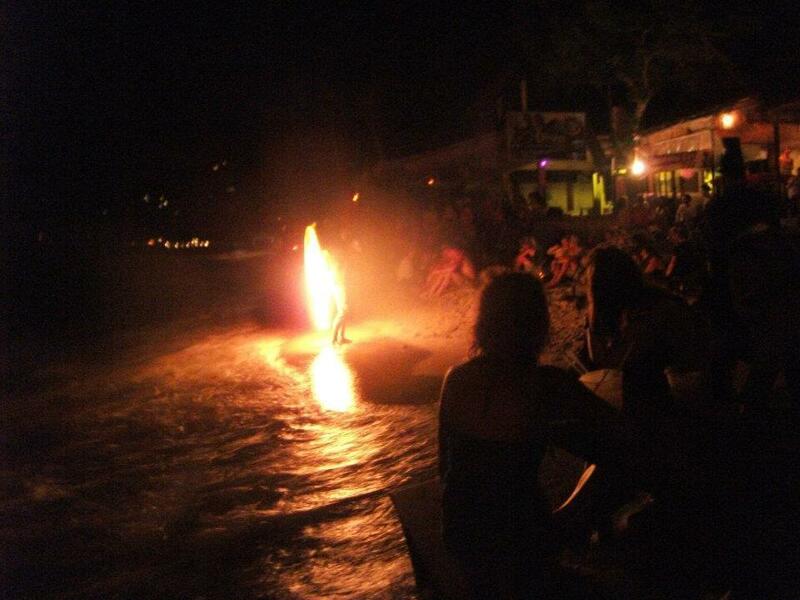 That night we went to lotus bar on the beach to watch a fire show which was absolutely brill! Then later on chilled on the wooden decking with some drinks. We had an early-ish night ahead of scuba diving, grabbing a crepe on the way home. We got up early and posted some post cards back home and went for breakfast! 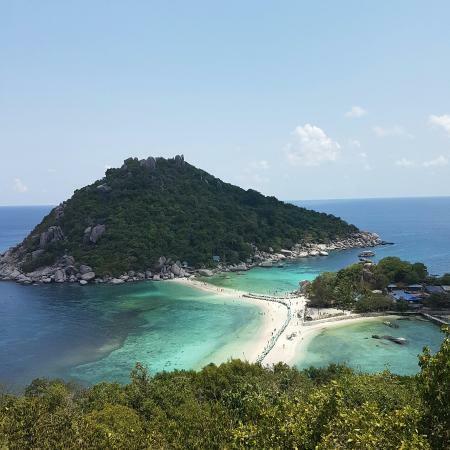 I can’t tell you how excited I was for this – Koh Tao is Thailand’s diving capital and travelers flock here from not just Thailand but the world to dive here. We made our way to the dive center and had our expected safety meeting to talk us through what we were going to be doing, the do’s and don’ts of diving and picked up our kit – wet suit, regulator, weights, flippers and BCD. 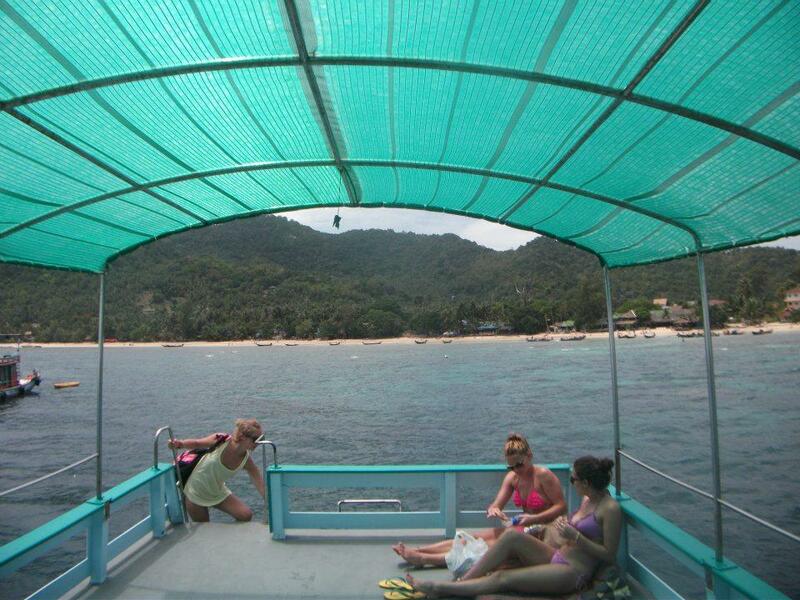 At 12.30 we got the boat to our first dive site in mango bay, where we practiced in the shallows of the water. Once everyone was comfortable we set off..
We were down in the water 40 minutes and what an amazing experience it was!! Literally the best thing I have ever done! 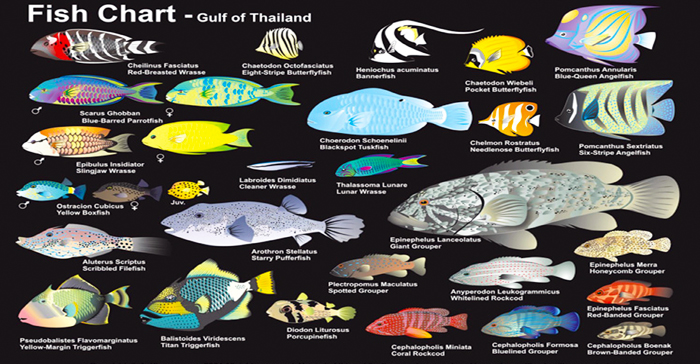 I have never seen such amazing fish (Dory fish and rainbow fish along with many more). The coral was unreal it was more incredible than the fish, it’s so pretty.. Christmas Tree coral was my favorite!! We had been warned in the safety briefing about trigger fish as they can be aggressive and territorial and have been known to bite divers – luckily none of us encountered this! 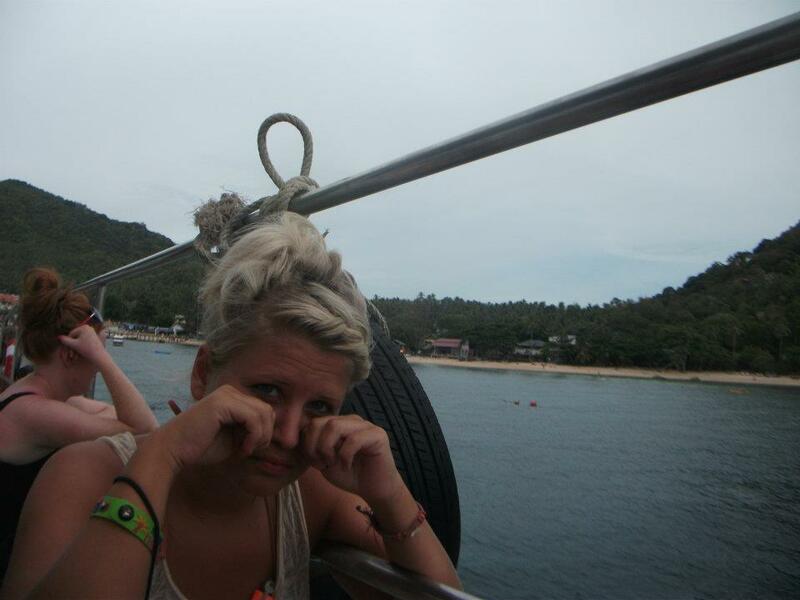 Once back on the boat it didn’t take much to sell us another dive at a different site for 1000Baht. On the second dive we went down 18metres and we saw more trigger fish, dory fish, amazing coral, hugeeee colorful fish ANDD TURTLES!!! 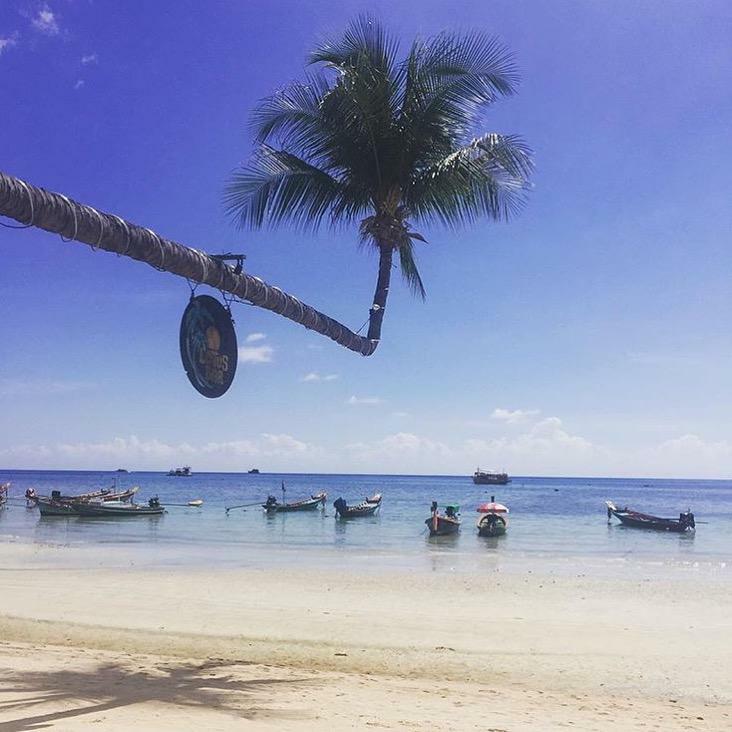 I highly recommend diving if you come to Koh Tao it is the absolute highlight of my trip! 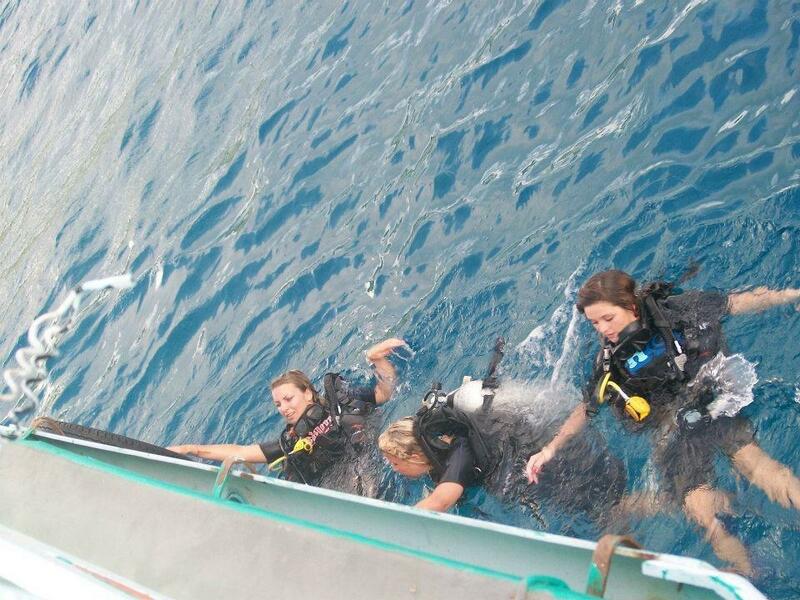 We got a certificate on completion towards a PADI also for if we did decide to do it in the future. Diving is hungry work and that night we had an all you can eat pizza buffet (every so often you need a break from rice to a different carb). We joined a pub crawl that night, it’s famous on the island and it was great finding new bars we hadn’t seen before. It was fun we had a right laugh and it was a lot more chilled out than the other islands we had been on. On the way home we couldn’t resist some street food of kebabs, corn on the cob and 7eleven food. 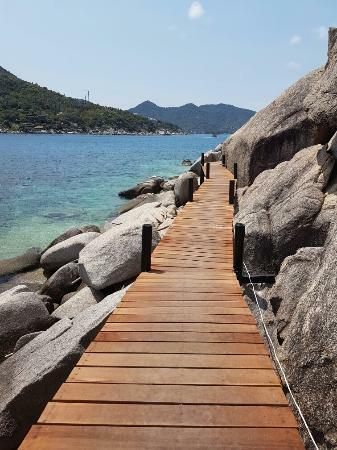 A chilled day was needed on a different beach… and chose Jansom Bay you access it through Sensi Paradise Resort. 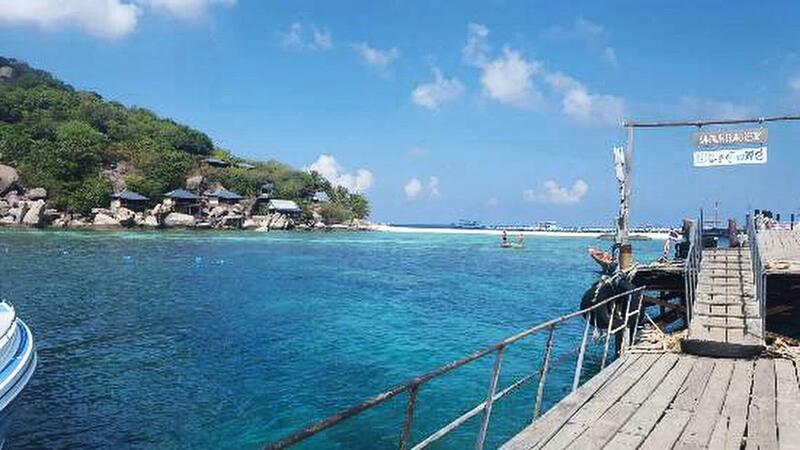 The entrance fee is 200 baht but is worth the price as it is a pristine corner, due to its lack of boat traffic, also has rich marine life. After a chilled morning we went for a quick lunch and planned our next move. 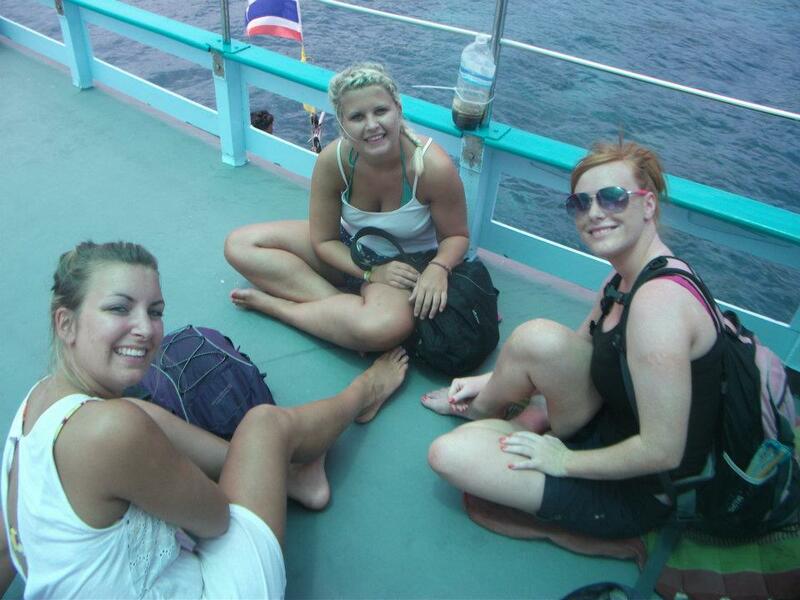 This was our biggest journey yet.. From south Thailand to Laos! Our visas were fast running out and we needed to get out soon. 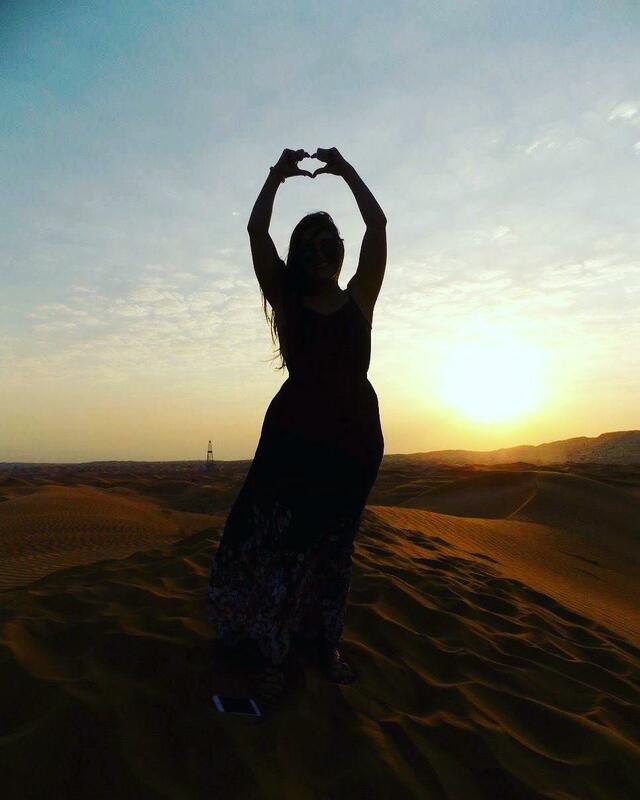 So rather than buying a longer visa we thought the perfect excuse to visit another country. It was going to be one hell of a journey but for around £20 it was an absolute bargain!! That afternoon we visited Nang Yuan island. 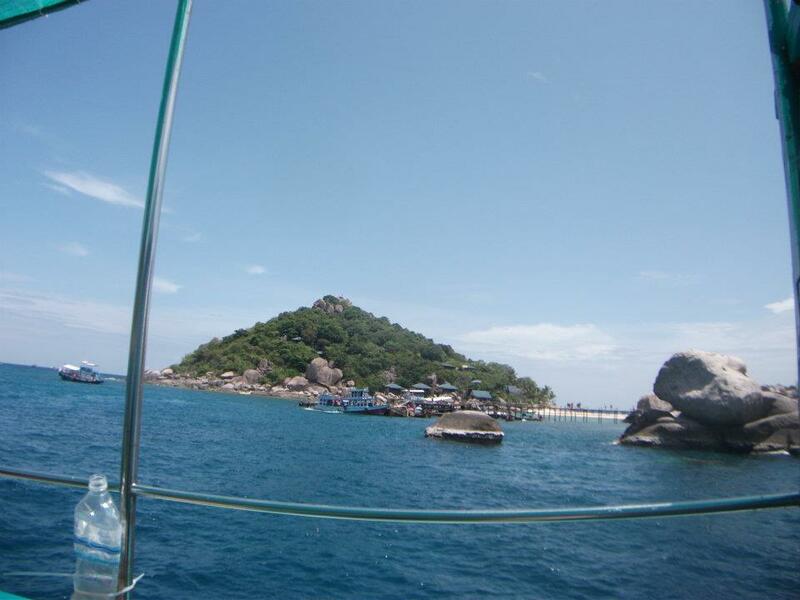 It is a tiny island around a 15 minute long tail boat trip for about 100baht. It’s made up of three small islands connected by a strip of white sand. 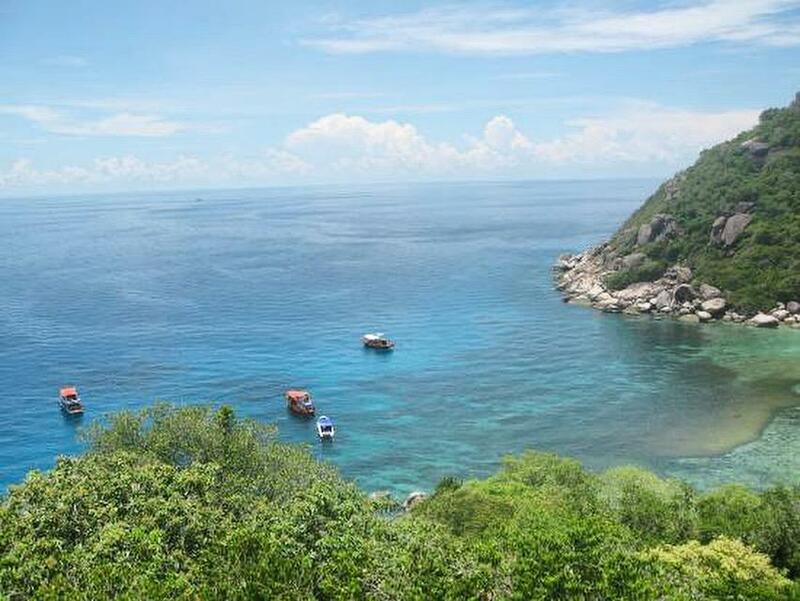 It is famous for its diving spots and its great snorkeling beach with its beautiful coral and marine life. This island is so tiny there is only one restaurant and one hotel on the island. 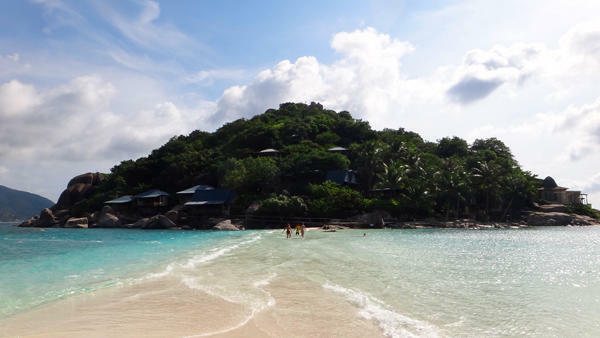 We loved this island and would recommend visiting here 100%!! On the way back whilst in the spirit of beach hopping we visited mango bay… this is what you call a deserted beach it is hard to get here so = less people. 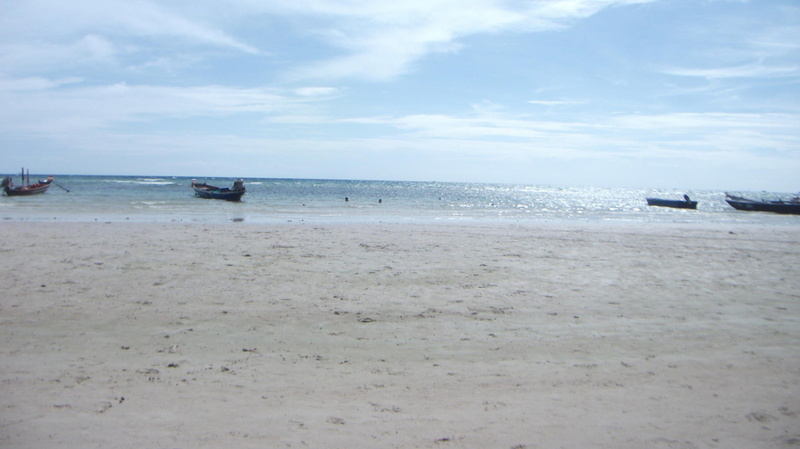 Is beach is a peaceful beach with a calm sea with great visibility in the water so perfect for snorkeling. After all of the sun we were burnt and decided on a quiet night. We went for a beautiful Thai meal and had a couple of drinks on the beach and watched the sun set. A quiet needed before heading on our next adventure. We had packed up our backpacks reading to leave this idyllic island. ad we were two days before heading to Laos it was time to take our first malaria tablet.. so we took it on empty stomachs and lay down… NOT ADVISED!! Being us we hadn’t read the instructions strictly advised you are meant to have just eaten and not lydown for 30 minutes!! 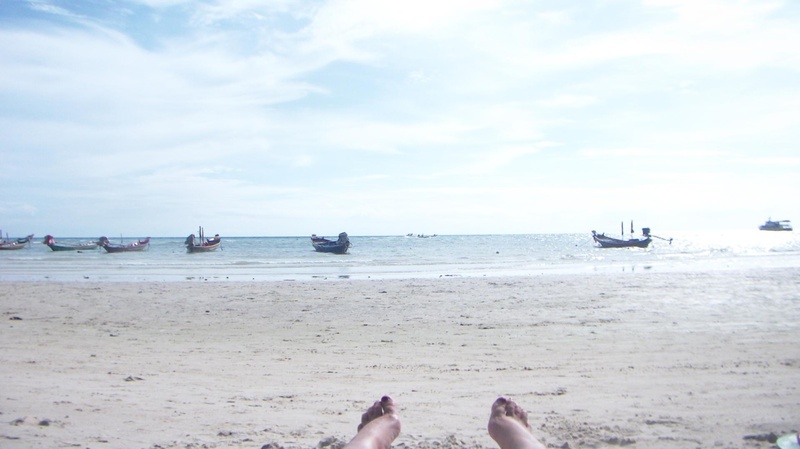 After checking out of our guest house and storing our bags for the morning we headed to a beach to spend the morning enjoying the last of the thai islands before heading up north. We grabbed sandwiches for our travels from a little cafe which were AMAZING. … it was time to leave this beautiful island. We jumped on our transfer and caught our ferry. We made sure we had a prime spot sat on the top deck. Taking some amazing photos as we said goodbye to the beautiful islands. 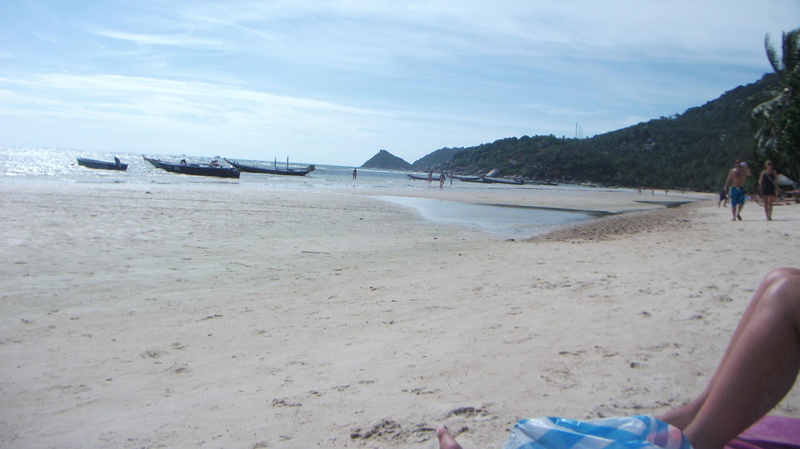 I loved Koh Tao! Been there twice, but never knew about the viewingpoint haha!